Yesterday (September 7) was my five year wedding anniversary. Usually, my wife and I take a trip somewhere out of town for this occasion, but this year we decided to stay in town during our vacation with no plans in particular other than that we would eat dinner at a nice restaurant on the actual day of our anniversary. This is no small feat mind you as my wife suffers from celiac disease aka gluten-intolerance. Essentially, this means she cannot eat anything derived from wheat, rye, barley, or oats (usually) without getting really sick in her digestive system for days. So if you think about how much food out there involves bread, pasta, or just seasonings that involve wheat as a filler product, then you can start to imagine how annoying and hard it is to find places where we can safely eat worry free. Fortunately, there are more and more places that are gluten aware and a few that even offer gluten-free menus, but even then we have to worry about whether the staff is truly well-informed because we have often encountered staff who prepare a salad with croûtons and simply scoop them off when they see the note about gluten-free food thinking that this will suffice when it will not. Over the last few years since her diagnosis, our restaurant choices have been pretty narrow as it’s such a pain to feel out a new place for safety and suitability, but in the last year we have had a new resource to turn to for guidance in the shape of the Atlanta Gluten Free Dining club. People share reviews there of places where they have successfully enjoyed gluten-free meals. So with our anniversary rapidly approaching and wishing to try someplace different, we consulted the group’s forum and found a few options including the one that we eventually settled upon: Roy’s. At any rate, back in late May, my wife Melinda and I went on a very nice and relaxing vacation trip on a Windjammer sailing cruise in the Grenadines. The idea for this trip has been hanging around in the back of our minds for quite some time now. Back when Melinda was in college at Georgia Tech, she was part of the sailing club and ever since she has been a big fan of sailing. While she was still at Tech, she saw an ad for the Windjammer cruises and thought that they sounded like a lot of fun. Fast forward a few years to when we got married in 2002: we were planning our honeymoon, and one of our top ideas was to take a Windjammer cruise. Ultimately, none of the cruise times synced up perfectly with our wedding dates, and instead, Melinda found us a nice package deal for a trip to Jamaica. We had a great honeymoon, but the idea of taking a Windjammer cruise at some point still lingered. Every year since our honeymoon, we have done some sort of vacation trip to celebrate our anniversary whether it be a trip to Jamaica or a week in Asheville. For each trip, we have considered a Windjammer cruise, but increasingly it became clear that we would never find an ideal match between the Windjammer cruise schedules and our early September anniversary. Add to this situation the fact that Hurricane season is still in full swing during our anniversary… Let’s just say a Windjammer anniversary vacation simply isn’t in the cards for us. Which brings us to early 2007. The first part of this year has been really stressful for the both of us at our jobs, but especially for Melinda. While I was at least gaining some job satisfaction during this period, she was mostly just gathering exhaustion and frustration. It was becoming very clear that she needed to take a vacation as soon as possible or she would crack. So one fateful day, I insisted that we take a Windjammer cruise like we had always planned, but that we do it then rather than put it off indefinitely. That was all it took to swing Melinda into gear. Shortly there after, she booked us a Windjammer cruise trip for the last week of May. Here’s a flashback to a pre-blog event that my wife Melinda and I managed to capture with my first digital camera which was a birthday present from her. 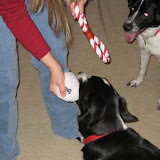 On Christmas Day after a very nice time spent visiting with my mother-in-law and her husband, Melinda and I returned home and got out the stockings that my mother-in-law had filled for our two boys Bodie and Doobie. One of the items was a small plush ball that most dogs would probably enjoy squeezing and gnawing on. But not so with Bodie. Let us observe the inevitable tragic outcome.